This article discusses troubleshooting solutions for the 5.0 version of the Bark Desktop App. Please make sure your Bark Desktop App is up to date on your Windows or Mac computer! Bark Desktop App got hung up? Bark Desktop App shows that encryption is enabled? Did you check iTunes and it still says encrypted? Note If due to another parental control or security application, please contact their support for further assistance on removing the configuration profile from the iOS device if the steps above do not work. Check is to see if your child's WiFi on the device is switched to On. Sometimes wireless gets switched-off on mobile devices to conserve battery or to join a faster cellular data network. From your Home screen, go to Settings > WiFi. Turn on WiFi. Your device will automatically search for available Wi-Fi networks. Tap the name of the Wi-Fi network that your computer is also connected to. If WiFi Assist is on, it is using a combination of cellular data and WiFi to make connections to the internet, but this may be preventing iMazing from recognizing the Apple device over WiFi. Go to Settings > Cellular or Mobile Data. Scroll down and tap the slider for Wi-Fi Assist to turn off. Sometimes, cellular data can prioritize itself over WiFi. You may turn it off by following the steps above to find the setting. This may help if turning off WiFi Assist did not. If WiFi is set to On (on both the Mac/PC and the iPhone/iPad) check to see if the iPhones and/or iPads are on exactly the same wireless network as the computer. In some homes there might be 2 or 3 other networks around you but they must be the same for Bark to be able to backup over WiFi. These are the wireless communications services your computer uses to communicate with the Apple device. Upload cuts out or says "Uh-oh something went wrong"? Restart your Mac or PC, the device, and your WiFi router. We recommend your router be off for 10 seconds before you turn it back on. If your internet connection is interrupted during the upload process, we will not receive your backup for analysis. To check your connection speed, run a speed test. You may have to reach out to your internet service provider if internet speed issues persist. You may want to try hard-wiring the computer connection with an ethernet cable connected from your computer to your router, if you're able. 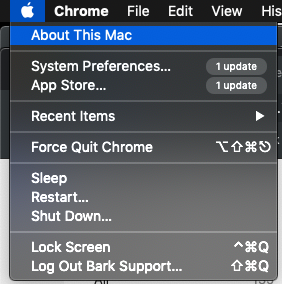 Is the Bark Desktop App not opening on your Mac? This is happening because of a permissions change in the new version of Mac. You can fix this by going into your System Preferences > Security & Privacy > Privacy and clicking on Full Disk Access. Note You may have to click the padlock on the bottom left of the window to be able to adjust these settings. Do you have iMazing open at the same time as the Bark Desktop App? You can now safely uninstall iMazing without any impact on your child's iOS device monitoring, since we've updated our Bark Desktop App to be able to do the work of what iMazing used to do! 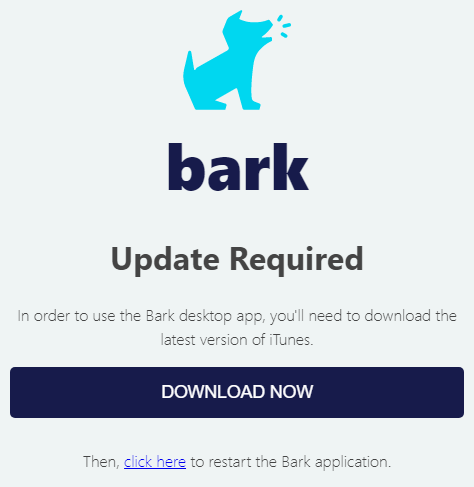 Is the Bark Desktop App asking you download iTunes? For Windows users: Download the iTunes 64-bit version directly from Apple here! Do NOT download iTunes from the Microsoft Store. Downloading from the Microsoft Store may be why you are still running into the message below. For Mac users: You can only update iTunes by updating your Mac Operating System (OS). To update your Mac OS/iTunes to the latest version, go to the top left Apple logo, select About this Mac. Select Software Update. Download the update. Install the update after the download completes. Running into an error with the initial backup? Try putting the iOS device in question on Airplane Mode. To do this, go to the Settings app on the device, and turn the slider On. If the back up completes successfully, remember to turn Airplane Mode off! Bark Support is committed to helping every step of the way. Please email help@bark.us or schedule a call with us!